I am Jon Theiss. I am a student at the UMKC School of Pharmacy working towards my doctorate in Pharmacy. I am a Veteran instructor and a first degree black belt in Shotokan Karate. I earned my black belt through Activstars in 2008 and became a certified instructor for Activstars in 2011. I teach with my family of Black Belts, Mark Theiss, Lori Theiss, and Zachary Theiss. We were taught and trained within Activstars and now teach for them. In addition to Shotokan Karate, we have also trained in Hung Gar, also called Hung Ga (洪家) and Hung Kuen (洪拳). The Hung Mun claimed to be founded by survivors of the destruction of the Shaolin Temple, and the martial arts its’ members practiced came to be called “Hung Ga” and “Hung Kuen.” We trained under Gongfu Master Mark Houghton at the Lau Family Hung Gar Academy in Hong Kong, China. He was taught by the legend Lau Kar Leung himself. He has also gained a great deal of fame from the 60+ movies he has been in with some of the greats actors like Bruce Lee and Jackie Chan. It was an incredible experience and we gained a wealth of knowledge from this legend in the martial arts. We have also trained under the great Wu Bin (吴彬), who coached and trained the Chinese Olympic Team for a number of years. Wu Bin has countless students that have trained under him including Jet Li, Li Jinheng and Kenny Perez (his first American Wushu student). He is the first instructor that we learned Wushu from and it was another incredible experience, learning from him and his Olympic Team. We continued learning Wushu from Kenny Perez a few years later, who is an excellent instructor and a Master in Wushu. Kenny Perez has trained with Jet Li and has been in several movies with him. We have also had the distinct privilege of training in Kung Fu with Shi Yang Qing, a Shaolin Priest. Shi Yang Qing came to America on a cultural visa and was able to stay for several years. Mark Steuver is a friend of Shi Yang Qing and was the first American to train within the walls of the Shaolin Temple in China and achieved the rank of Monk, also a first for an American. We have trained with Mark a few times over the years and have greatly enjoyed the experiences. We have learned several katas and weapons from Weapon’s Master Jerry Cook. Jerry has numerous black belts in the martial arts, such as Budo Kan Ju-jitsu, Tai chi, Kenpo and Okanawan Go-Ju-Ryu to name a few. In 2005, Master Cook was inducted into the Martial Arts Hall of Fame and was put on the International Grandmasters Council. It has been a great honor to take training from this great martial artist. Currently we are training with Master Kraig Hollingworth and the Toushi Kan Martial Art Institute. 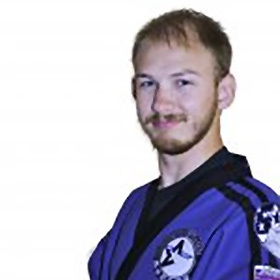 Master Hollingsworth is a tremendous instructor and was inducted into United Martial Arts Hall of Fame in 2013. We also have certificates in Chin Na and Dragon Form. We train and teach a wide variety of weapons in our classes and we are proficient with the Quan Dao, Single Broadsword, Twin Broadsword, Broadsword and Shield, Twin Tigerhead Hooked Swords, Straight Sword, Katana (Bokken), 9 Ring Broadsword, Nunchaku (Single and Double), Fan, Bo Staff, Tonfa (Single and Double), Double Daggers, Shuriken throwing, and Double Butterfly Knives. We also teach Shuriken throwing, also known as Chinese or Ninja stars. We also have trained and performed the traditional Southern Lion Dance. The Lion Dance originated in China close to a thousand years ago. It is usually performed as a ceremony to scare away evil spirits and to summon good luck and fortune. The southern lion exhibits a wide variety of color and has a distinctive head with large eyes, a mirror on the forehead, and a single horn at center of the head. The lion dance also symbolizes the myth of the Chinese new year and is performed during this time throughout the world. I enjoy teaching classes with my family and encourage my students to do the same; to practice and learn as a family. Practicing as a group makes it easier and fun and builds relationships that last beyond a lifetime.